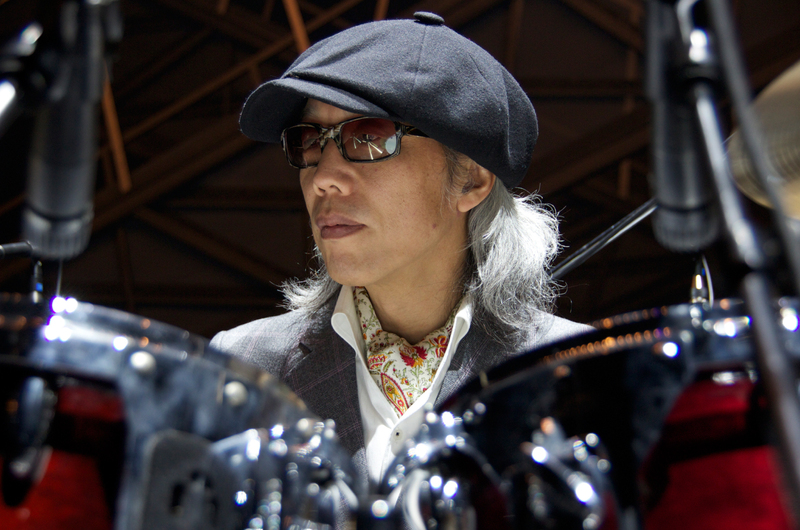 Japanese groovin’ artist Gota Yashiki was born in Kyoto, where he was taught by his father to play traditional Japanese drums. In 1982, he moved to Tokyo and joined Rude Flower (later becoming the highly acclaimed reggae-influenced band Mute Beat) as vocalist/drummer. Subsequently, Gota went on to join Melon on their British and European tour, later bringing him over to London for the recording of their album “Deep Cuts” for Epic. He then returned to Japan to work for Major Force (compilation released through Mo’ Wax). On his return to the U.K, he worked with Soul II Soul and Bomb The Bass, joining the latter on their U.K & European tour. Gota played a major part in the creation of “Jazzie’s Grooves” on “Back To Life” & “Get A Life” and etc―c by programming, playing drums and bass (unfortunately incorrectly credited on the sleeves). He also played and programmed all the instruments for Sinead O’Connor’s “Nothing Compares 2 U”. Going on to produce albums by Michael Rose, Bomb The Bass and to work as “Groove Activator” on tracks by ABC, Gavin Friday, Swing Out Sister, Vivienne McKone and etc―c he also produced Seal with Tim Simenon on one of the versions of “Crazy”, which was released as “Krazy on 12” which sounds very like Trevor Horn’s version which came out later. Having joined Simply Red for the recording of the multi million seller “Stars”, he also wrote and recorded a team song for Nagoya Grampus 8, the Japanese team Gary Lineker played for. Gota worked with acts like Depeche Mode, Oleta Adams and Bjork on several tracks, as well as working on Seal’s second album “Kiss From A Rose”. He completed and released his first leader album “Something To Talk About” as Gota & The Heart Of Gold, receiving critical acclaim and several awards. Gota then mainly concentrated on his follow up album “Live Wired Electro” under a new moniker Gota & The Low Dog, but found some time to work with the French group Stone Age. He has teamed up with Neneh Cherry on a track for a Marvin Gaye tribute album and with Seal on a version of “Fly Like An Eagle” for a Michael Jordan film. He also released a sample CD “Groove Activator” which has constantly been used by different artists all around the world, and is included on Alanis Morissette’s Grammy winning album “Jagged Little Pill”. In 1997, his first U.S album “It’s So Different Here” which is a remix album of “Something To Talk About” reached No.15 on the Billboard chart and No.1 on the R&R chart, his first single was voted as one of the best top ten Smooth Jazz tracks for ’97 (first time by a new artist). Gota produced the Simply Red album “Blue” in 1998, which reached number 1, which was followed by a tour as Simply Red’s drummer and numerous TV appearances. During this time, he also completed additional production for the Lighthouse Family and as well as working on his second U.S album “Let’s Get Started”, he wrote the sound tracks for an MGM movie “Mod Squad” and also an American/Japanese animation movie “Alexandra”. In addition, at the end of the year he started co-writing with a promising new act on ZTT called David’s Daughters. 1999 got off to a great start with the release of a single from his U.S album “Let’s Get Started” which immediately received very positive radio and press support and another album “Day & Night” soon followed. He also continued working with Simply Red and produced the next album “Love & The Russian Winter” and also spent time co-writing and co-producing the Lighthouse Family’s new album “Whatever gets You Through The Day”. Around the same time, he also worked closely with Tom Jones on the track, “Ain’t That a Lot of Love” which is featured on the “Reload” album. A few months later, “Love & The Russian Winter was released with a song of the same title. The initial idea was for Tom Jones and Mick Hucknall to do a duet on a modernised version of the soul track. Jones wanted to keep the soul vibe of the original for his album so, Gota and Simply Red collaborated on the version that can be heard on Jones’ album today. However, with the modernised track already made, Simply Red went ahead and released it and it became a worldwide hit. After working on other projects, Gota has produced a number of tracks for the Simply Red album “Home” (No. 2 on the UK charts at the time of writing). After releasing the collaboration with Jimmy Gomez, “Ver 1.0” under the group name, “B.E.D.” Gota’s interests moved to the Japanese music scene, working with artists such as, Fumiya Fujii, Noriyuki Makihara, Shikao Suga, NOKKO just to name a few. ©GOTA YASHIKI All rights reserved.